There are many definitions to learn that defines the Six Sigma approach to problem-solving. Six Sigma principles that are taught in the Lean training course and also in the free Six Sigma training deal with all sorts of terms that refers to quality as the result of a process – or rather the lack of quality. If you are somewhat familiar with Six Sigma, you will have heard of terms such as Defects per Unit (DPU), Defects per Opportunity (DPO), and Defects per Million Opportunities (DPMO). 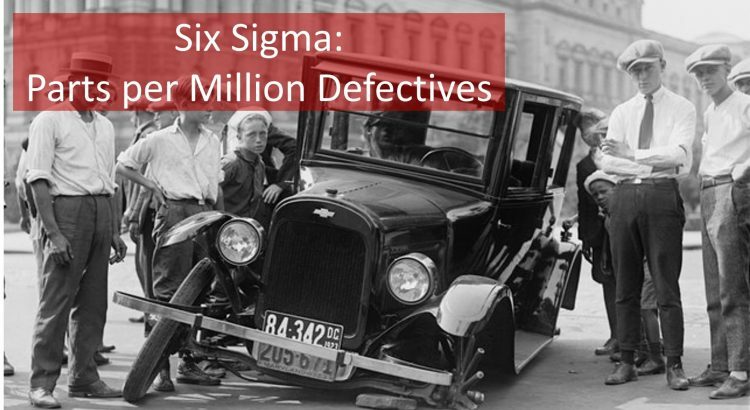 Another significant term to learn if you want to understand the concept of quality in the Six Sigma approach is Parts per Million Defectives (PPM). PPM Defectives is abbreviated as PPM. PPM defectives is a part of the language of Six Sigma. It pervades the sales pitch and is used in all sorts of computations; as a measure of quality. PPM defectives is one of the simplest metrics in Six Sigma to understand. It refers to the expected number of parts out of one million that you can expect to be defective. It is a measurement used today by many customers to measure the quality performance of their suppliers. There was a time when a provider with the 10,000 PPM defectives was considered as an excellent supplier. Let’s review the definition of defective. Defective is not the same as defects. A defect is anything that is outside of the customer’s expectation. Products with defects may still be sold to a client, even if the customer is not entirely happy. Think about a typo in a book. A defective product is a product that cannot be sold to the customer i.e. scrap. Consider a book that is falling apart or that has pages missing. Now that we understand the meaning of defective we can move on to learning more about PPM defectives. PPM defectives is a measurement used today by many customers to measure the quality performance of their suppliers. There was a time when a provider with the 10,000 PPM defectives was considered as an outstanding supplier. 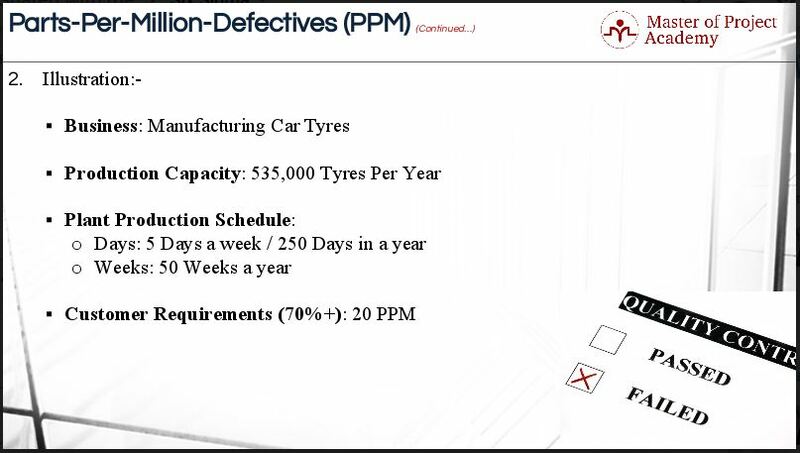 A PPM defectives rate of 10,000 means the defect rate is less than 1%. However; with the passage of time, the expectations increased to 1,000 PPM and now, the expected PPM rate, especially in the manufacturing industry across the globe, is around 75 PPM. One PPM defectives mean one defect, error, or event in one million. It is a value that represents the part of a whole number in units of 1/1000000. Let us have a look at an illustration for how to calculate PPM in Six Sigma here. We are talking about the business of manufacturing car tires. The production capacity of the company is 535,000 tires per annum. The plant operates around 5 days a week, 50 weeks per year or 250 days a year. Around 70% of the customers of the business requires 20 parts per million defectives rate. It means that the manufacturer would be allowed to produce 11 defective tires for every 535,000 tires. In other words, the business would be allowed to manufacture 0.92 defective tires per month. If the manufacturing capacity of car tires reaches to 1 Million tires per annum, then the manufacturer would be allowed to produce 20 defective tires. Let’s look at PPM defectives from a different angle. Another car tire manufacturing company can produce 10 000 000 parts per year for its customers. The company makes tires 5 days per week, 50 weeks per month, and 250 days per year. If the customer requirement is 25 PPM defectives. That means that the company can manufacture 25 defectives for every 1 000 000 tires or 250 defective tires per year. That means the company is allowed 1 defective tire for the entire plant per day. This is the way of how to calculate PPM formula. Measuring Parts per Million defectives mean that you have physical proof of whether you conform to your customers’ demands. It also means that you can have a solid idea of the quality that your company produces as well as the extent of waste that is being created. Why produce waste when you can produce quality products? 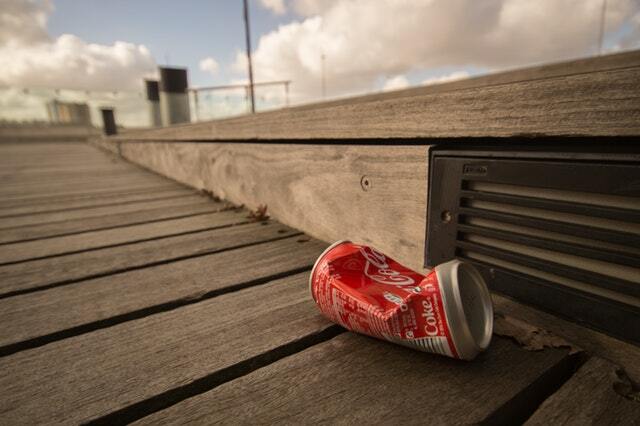 The Six Sigma problem-solving method helps to identify the root cause of any waste that is being produced. If your process produces too much waste or defective products, it is a good idea to send a certified Six Sigma team in to look at the process and to find the root cause of the problem. Often it is a small problem that can be easily fixed if one knows about it. But a little problem that may be overlooked if Six Sigma is not applied can have a large impact on quality – and Six Sigma is there to point it out. PPM defectives may seem like a small, insignificant metric. That’s not true. It is the one metric that customers’ demand of their suppliers to conform with. Parts per million defectives is the one metric that companies can look towards for a real understanding of the quality of their products or the lack thereof. PPM defectives guide Six Sigma practitioners to improve upon processes until the best possible quality standards can be sustained. One of the reasons why PPM defectives are so important is that it looks at DEFECTIVES as opposed to defects. How much junk does the company produce? If you are a business that doesn’t want to be known for producing junk – get a certified Six Sigma team to reduce your parts per million defectives rate.